The Itty Bitty Kitty Committee: Get a Load of These Ladies!!! Get a Load of These Ladies!!! Awwwwwwwwwwwwwwwwwwwweeeeee! Look!!! It's Georgette and Miranda!! Thanks goes to their Pa, Mike, for sharing the pic. They turned into such lovely, lovely ladies, didn't they? Mike says "they are the best cats ever". I bet they are. They were pretty spectacular kittens. Gorgeous girls...I always loved their markings. Thanks for the update Dad! Awwww What gorgeous young ladies! Thank you, Mike, for these great pictures. Looks like Georgette and Miranda are so happy you are their Pa!!!! Eeeee!!! They are so grown up! But they have that expression on their face that tells me they are still very much a pair of mischievious kittens that like to cause trouble! They are so beautiful. 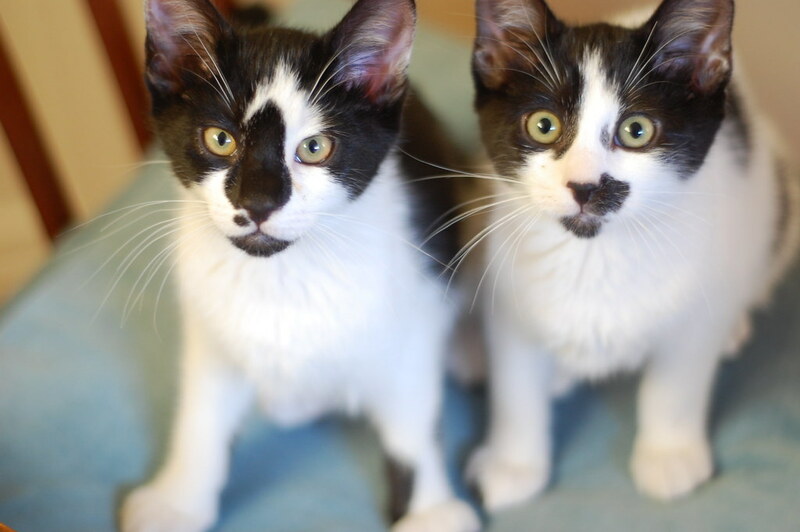 Their markings are just spectacular! Oh wow. They look like kitties by Picasso. 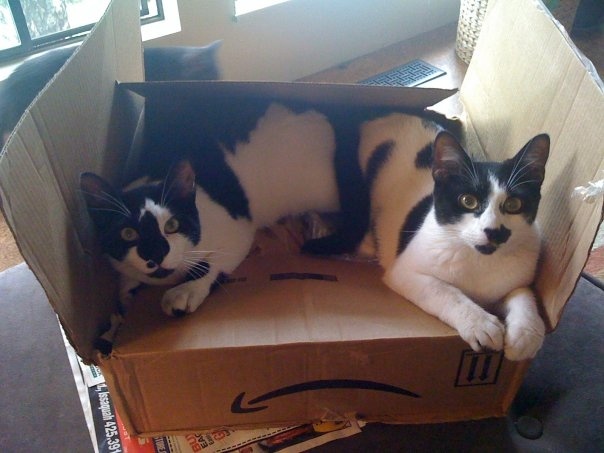 Adorable and oh, they like Amazon too! Very pretty girl kitties. Healthy, bright-eyed, alert, plentiful 'skers. What a pleasure to see them again! Mooo! They're like little bovines. Sweet darlings! I don't know. It looks like they have a pretty bad box addiction. I think it's time for boxhab. Georgette is one of my all-time faves. It's nice to see that she's happy and still with her lovely sis. I always love these updates - I had such a soft spot for the Labath ladies, so it's wonderful to see these two looking so grown up and healthy! These two were charmers when they were IBK's but their dad has surpassed all expectations - these girls are well loved and happy...and ready for mischief! What big, sleek, beautiful ladycats! Ive been following Enid and Hester's blog, and it's so nice to see how their littermates are doing, too! they just keep getting prettier! Love love love update photos. They so do my heart good. And these are two beautiful ladies. It's so fun to see them again !! They look great ! Ooooo my how lovely they are! Lovely? Gorgeous! It's so good to see them! Thanks Mike for sharing their pics.